3rd September 2009. My Plans and Downloads, Photo Comp and ExplorOz National Gathering, Poll Results, Business Membership, and a Trek Update - Brindabella National Park. Our online mapping system is finally taking great shape with the inclusion of user waypoints and route creation in My Plans, and implementing a multi-format downloader. For example, you can download an ExplorOztrek note (routes and waypoints) as a GPX file and import it straight into OziExplorer, TrackRanger, andMemory Map for viewing. 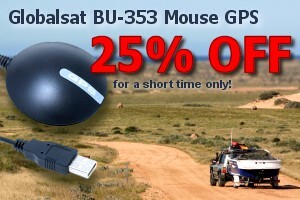 Have you considered turning your laptop into a powerful GPS unit. Yes you can!!! with theGlobalsat BU-353. Don’t pay up to $190.00 elsewhere, we’ve got this item available for $75.00 for a limited time only! Don’t forget to get yourMapping Software andDigital Maps to help you create your very own customised unit. And if you’ve already got one of these receivers, now is a great time to pick up a spare. We’ve also just added theLiquid Soap range fromSea to Summit, products are available for yourhair, hands, body andclothes, and are both travel and environment friendly. And now the moment you've all been waiting for - the announcement of the Photo Comp winners. Congratulations to Member - Grazz T (NSW) for his photo "Driving the Simpson", chosen as the winner. 2nd place goes to Member - Fiona & Paul for their photo "Tuena Sunrise" and 3rd place to Member - Josh (VIC) for his photo "Signing up a new member". Whilst there were many high quality, technically expert and aesthetic beautiful submissions the final selection was based on the best visual depiction of the meaning of "ExplorOz". We are proud of the great communal spirit portrayed in the comp and we’d like to thank all who participated. Just a reminder that there's still room for anyone wanting to attend the 2009 National ExplorOz National Gathering in St George - put your name down here and come and enjoy meeting probably the largest group of Members ever expected at a gathering. 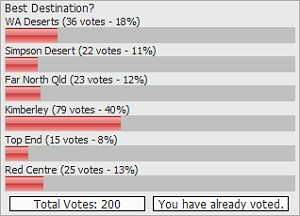 The results of our featured Poll asking your favourite destination are now in and the WINNER is... Kimberley! ExplorOz Business Membership - Join Today!! SERIES 2 FILMING NOW - FOLLOW PAT ONLINE!! Pat Callinan's 4X4 Adventures is set for another cracking season. From the world’s whitest sands in Esperance to the world’s reddest dirt in Kalgoorlie, the trip then heads north to film two episodes on the mighty Canning Stock Route - one of the few times a professional film crew has been unleashed on its entire length. The show takes in Tanami Track, Red Centre, Kings Canyon and Palm Valley before heading to Barrington Tops, followed by Tasmania. With a new one hour format, view it prime-time on ONE HD or Sunday arvo on TEN. 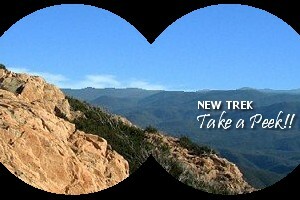 Follow Pat and his family via his online blog on ExplorOz. Click forPat Callinan’s Blog. Save 25% off our most popular seller! !